Shhhhhhhh! Do you hear that? The sound of church bells tolling in the distance….do you hear it? It’s May, and you’ll hear a lot of those now that the wedding season is in full swing. May is a popular month for outdoor wedding events in many parts of the country because the air is yet untainted by the overwhelming aroma of summer barbeques and swimming pool chlorine. The foundation of this tiny round table for four is a full-length white linen topped with a soft blue Ralph Lauren “Veranda Paisley” cotton linen from TJ Maxx. Silverleafed terra cotta chargers and simple white Corelle plates are enlivened with a soft blue cotton napkin from Burlington. Luncheon breads are tucked safely away from nosy birds beneath a 6″ clear glass cloche from Hobby Lobby. 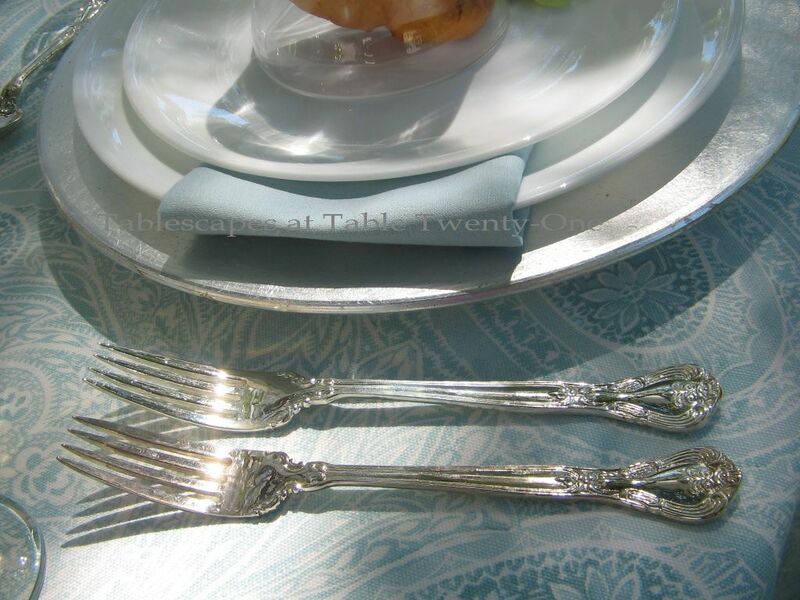 The Baroque design of heirloom flatware is a good fit. I chose this particular iced beverage glass because of the shape of the stem. The ball there is similar to that of the top of the cloche and the “ankle” of the floral vessel. I always try to consider shape similarities when choosing tabletop items to create a sense of unity. Your guests won’t necessarily make a conscious connection, but their subconscious will pick right up on it as that “something” that makes the table work. This is yet another reason why it’s good to get very well acquainted with your personal tablescaping inventory. A clear glass vase of simple apple blossom branches is the only centerpiece needed. The sheer white canopy is festooned with the traditional “something blue” of trailing silk ribbons. 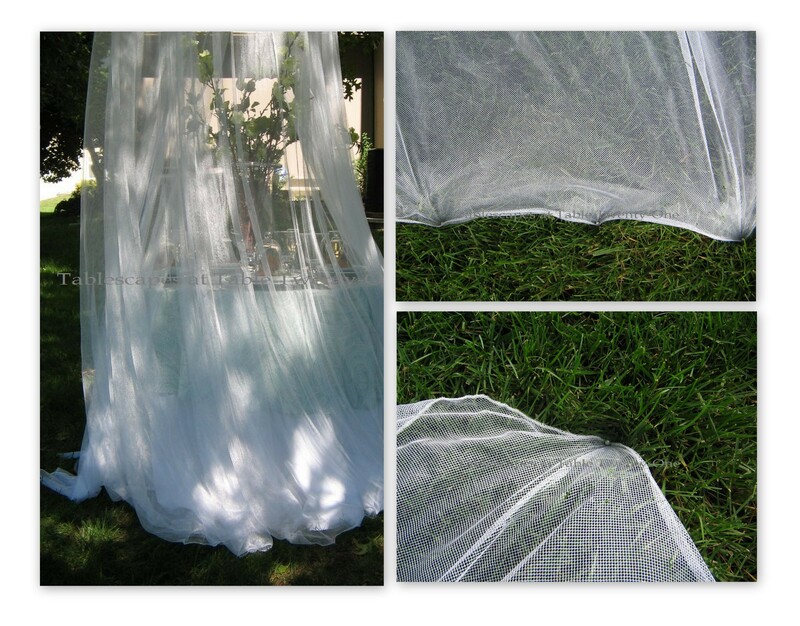 When the breeze catches it just right, the canopy looks like a bridal veil or the train of a beautiful gown. The canopy is anchored away from the table to accommodate chairs just before lunch begins by using pearl head pins along the hem to secure it. 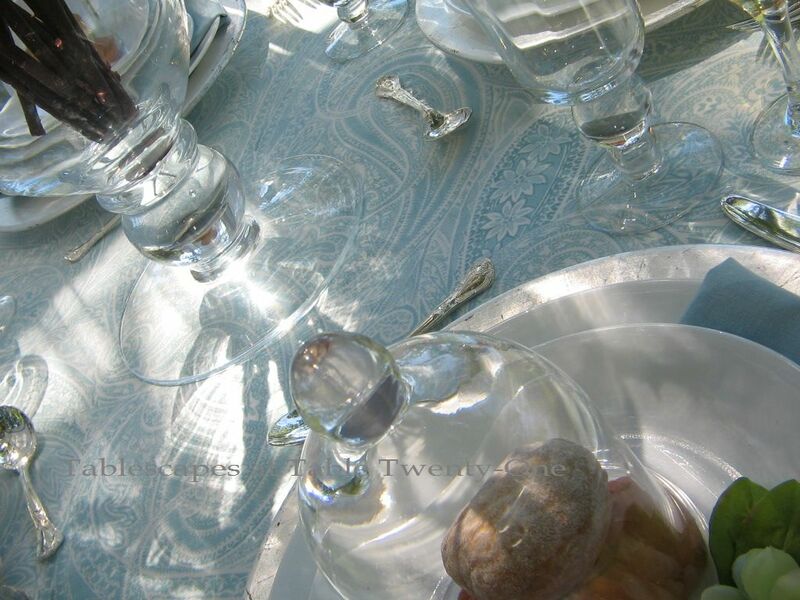 I am joining Susan at Between Naps on the Porch for “Tablescape Thursday” again this week. I hope you have a chance to visit! Gorgeous as usual. Its almost ethereal. I would love to eat out there on all those beautiful things. Hey I agree with the other two is there room for me three in your brain. I can see we’d all have a party. Alycia you are one amazing lady!!! Lucky would be the bride who gets to celebrate at this table! Glorious! As usual everything is so well thought out and perfectly put together by a genius with intimate knowledge of her inventory. Oh my….I am waiting for Bambi and Thumper to stroll across the yard…and the birds whistling a happy tune…and then Snow White and her Prince Charming come from behind the tree to sit at the gorgeous table to celebrate their wedding…I have never seen such beauty and creativity….Boy, I thought I was creative when I used a gazebo in the reception hall for the cake…so this “takes the cake”…May I present the Oscar to……. Yes, May is perfect for weddings…My son’s wedding was an outdoor wedding in May…the most perfect day, perfect weather with the backdrop of beautiful horses behind the fences…! So cool………….I wanted to pick that glass up and enjoy. Any bride would be happy with this arrangement. Ahh, I love it! You are such a romantic Alycia! What a sweet setting and what bride wouldn’t feel special here! Great idea with the cloche too! You really never know what you will be dealing with outside, especially under a tree! I love the Ralph Lauren tablecloth (I have it in yellow!) It’s a nice delicate look and adds a pretty accent! Great job! Oh, this is just so beautiful! 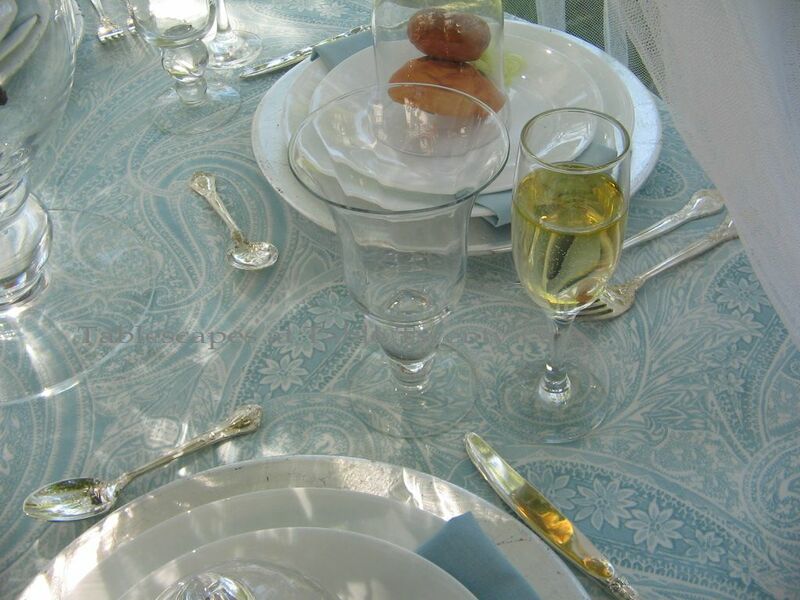 The paisley cloth is perfect, and I like the choice of blue for this table instead of the more predictable pink. 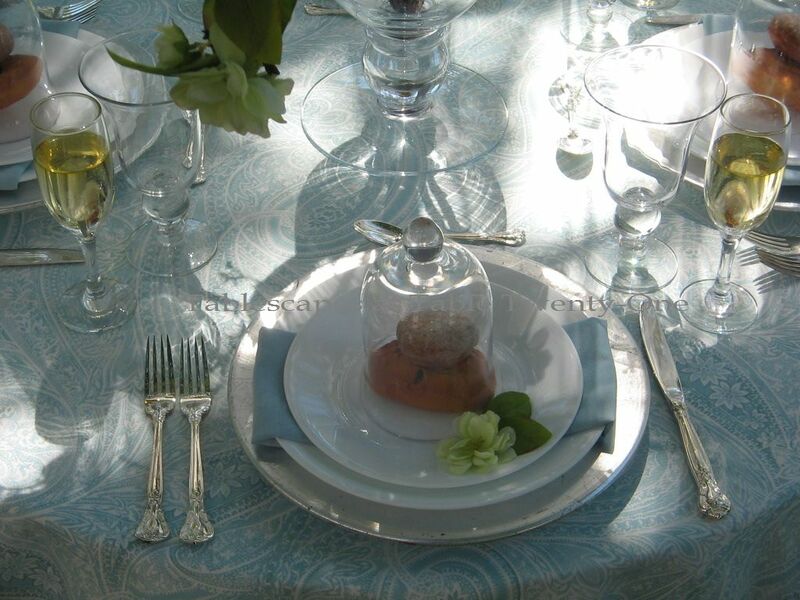 The simple white dishes work with the more elaborate stemware and flatware. And your centerpiece is so lovely (I did a similar centerpiece in this week’s tablescape!) and I see the perfect blue butterfly has also graced your table. Beautful table in a beautiful setting! I miss those big trees! I absolutely adore this. The net is gorgeous, as is your table. All the detail such as the shape of the glass stems fitting the shape of the dome handle is what gives you tables such elegance. Love your florals for this event too. I am blown away! LOVE the veil look flowing in the wind! Colors are soft and pretty. Okay, the veil look is just so clever…..so creative….LOVE it! How Beautiful! I love outdoor weddings, but if anyone has planned one for North Alabama in May, we have already skipped past beautiful spring weather into melting away summer heat! I just love weddings and this table is perfect for celebrating such a happy occasion. 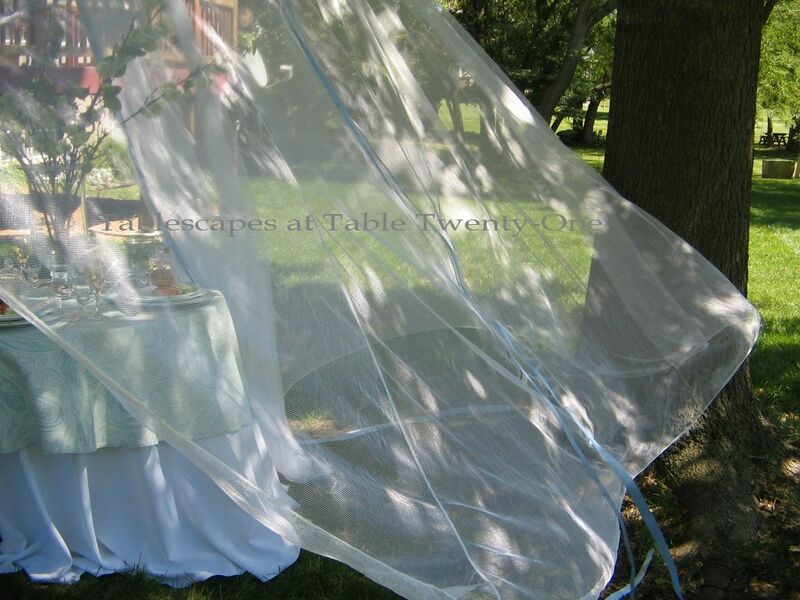 I love that Ralph Lauren table cover…I am going to have to start remembering that I can use a smaller size as a topper. I get caught up in looking for the size that fits my table and sometimes miss the “big picture”. And what a trooper you husband is for hanging your canopy. It looks wonderful and so romantic. Have a great weekend! You did great! AGAIN! Thanks for sharing this fabulous tablescape! Ohhhh la la… Love this post. Very romantic. Absolutely my fave. 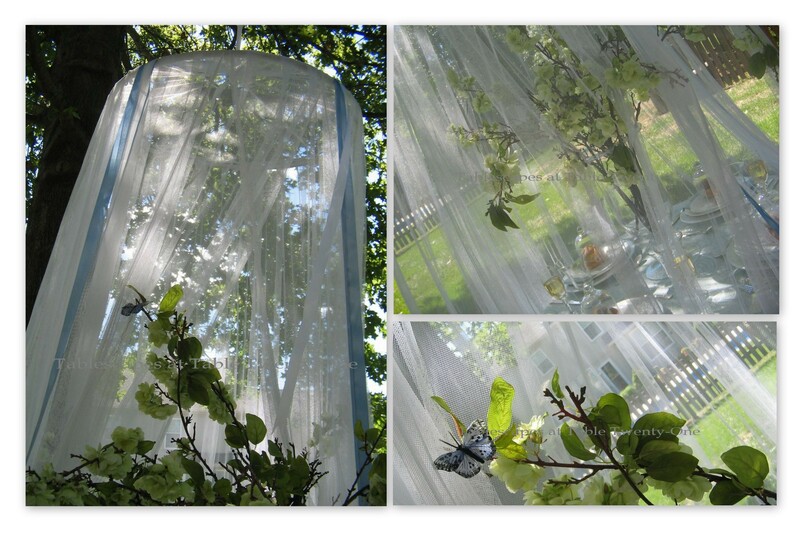 Last summer, I had posted the canopy in my garden too. Isn’t it funny that Tablescaper’s have something in common? Thank you so much for always giving me your supportive words everytime your dropping by. It always give me a positive thinking and it more easier to hang on on my daily thoughts. You are one of the best bloggie friend I have, together with Marty & Fabby. You’re a blessing not just in my bloglandia. Oh my goodness, Alycia…you’ve got to be the greatest tablescaper lady I know darling!!!! (I also see a little helper, hahahehe) This small, white, elegant and romantic table is absolutely exquisite to the eye…ok, it is eye candy! Such talented tablescape designer you are sweet friend and I always run when I see you’ve posted, I’m always bewildered!! I have good news and a tablescape at Sofia’s. 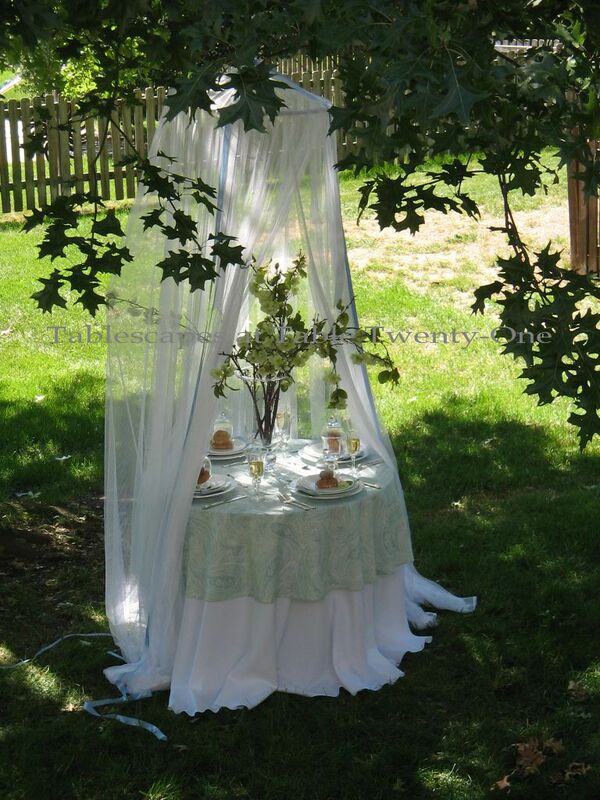 Wow another beautiful escape to a romantic outdoor place for a bridal luncheon. It could also be a romantic place for a newly wed bride and broom to dine. How sweet your luncheon looks and the canopy just tops it off. Hope no birds or squirrels made it to the table. So soft and elegant Alycia. .
What a beautiful tablescape, Alycia. I just love the beautiful setting of your back yard, the ethereal feel of the floating canopy and the gorgeous tablescape. I am a sucker for paisley, but the color of your tablecloth mixed with the white and silver is just stunning. And the mini cloches are so adorable. 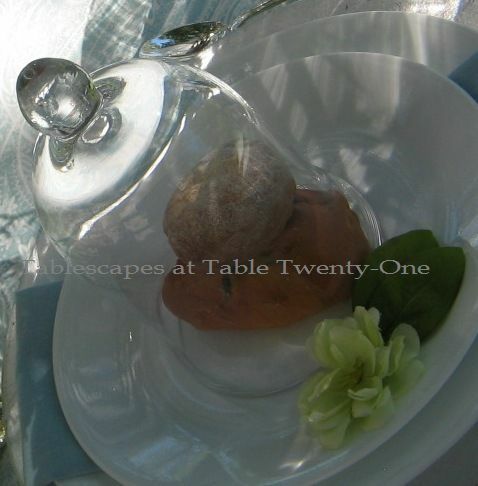 What an elegant touch to your beautiful table. Your attention to detail and sense of style is amazing. Thanks for sharing your gifts with us. So I’m not the only one in wedding mode this week… Love this, Alycia! The setting is delightful, and I totally agree with you about the subconscious connections. You hit a home run on those! BTW, that gorgeous cupcake in my post? I have a cupcake inspiration board with that one and some other beauties. You’ll love them! I’ll send it to you later today. Alycia, gurl I can just picture us having a lovely luncheon with that lovely decanter of white wine…….this is truly a Victorian display and beautifuly done. I was born 150 years too early, as if you couldn’t tell. I meant 150 years too late, my sister is 150 years too early…. Oh, my. So romantic and lovely – I am talking as much about your husband (so sweet to do that for you) as I am the setting. I feel cooler just looking at it (so hot here today!). I am laughing about the nests and hope you will tell us what happened! We love to eat outside but I am always worried about setting things up too far in advance. I have covered a whole set table with a tablecloth. On Thanksgiving, we decided to eat outside about 30 minutes before our guests arrived and it was a scramble. I don’t even want to think about what may have happened to your beautiful canopy. Just love your silver flatware. Corelle would make a fortune if they used your photos to advertise! You did great as always. 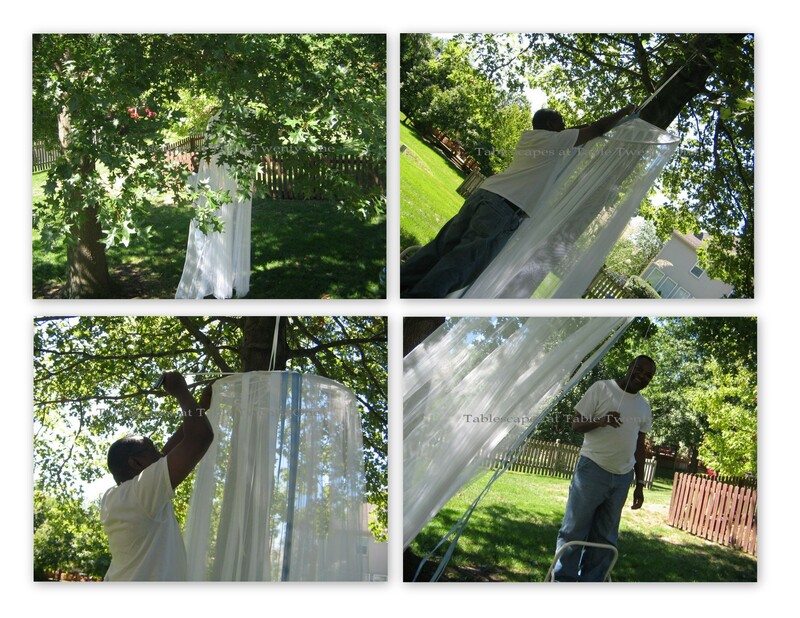 Clever idea hanging the canopy from the tree. It looks so romantic. Love the small cloches. Your husband is quite the trooper. Hmmm, so a bird nest was occupied? I hope it comes back. I was just sitting outside relaxing after a day of gardening. The hummingbirds were fighting over a feeder. The ground squirrels came out to explore and all different birds were using the bird feeder. It’s always so nice to dine outside. It’s a pleasure visiting with you. I LOVE that table, so fresh, summery and elegant. That outdoor setting is to die for! Looks SO romantic!!! 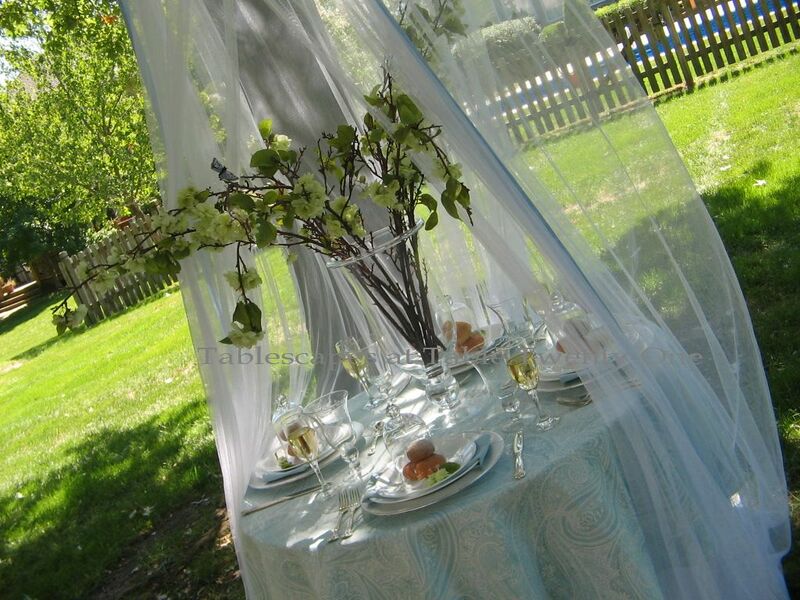 Beautiful canopy and gorgeous silver flatware. What a lovely idea. Your table is gorgeous, Such a sweet Southern fragrance. Very romantic. I just pinned this! I love every romantic thing about it. I’ve been out of town for over a week and am just trying to play catch up. This was a treat!! Well I’ll be filing this idea away for, hopefully, a future bridal luncheon. Yes, I agree, the canopy in the wind resembling the bridal veil is soooo romantic. My girly girl daughter would love this! As long as the birds stay in the nests and don’t go fluttering around inside the canopy! lol Seriously this is beautiful and all the components are so pretty, especially the little cloches. Are we wearing hats?? Ahh, love those apple blossoms. You have such a nice hubby!! Just beautiful! The photo with the breeze flowing through the “veil” is divine! I love that your DH helps you just like my Mr. B does for me. Share this at my party on Tuesday please? I hope you have a wonderful holiday weekend!